Discussion in 'Hats' started by Lefty, Sep 2, 2009. Can anyone tell me anything about this hat? Yes, it is a very poor picture. That's interesting. Owner is claiming 100 years old, would that be correct? I'm trying to get more pics and info. Based on our conversation, the hat seems to be in decent shape for it's age but probably needs some work to be worn regularly. Any recommendations on an offer price for one in, say, good condition? RM, that's a PDO Stetson Clear Nutria, and from what I can see, it's a Philadelphia hat. That smaller embossment on the left appears to be the Fray sweat trademark. Fray was a Stetson employee and the only one they ever allowed to apply for and receive a patent while employed there. RM, that would not be out of line as far as age. I have one, though not listed as Clear Nutria, it would probably have been made between 1890-1910. W/O seeing the hat as a whole, it's going to difficult to determine a price point. Sent directly from my mind to yours. Like me, Jim, Pretty Damned Old. DOGMAN, Frunobulax, Zombie_61 and 3 others like this. Would you venture a price range based on poor to excellent? Rmccamey and AbbaDatDeHat like this. That Clear Nutria die stamp does indeed correspond to the early 1900's catalog posted by Justin. Jhoff_1979, DOGMAN, Frunobulax and 6 others like this. Cool beans, Jared. I'd like to have a copy of that catalog as I'm sure it is a great reference. Thanks for the link. Zombie_61 and Bamaboots like this. I don't own any Stetsons or beaver felt hats (yet), but my Sunbody (made from their standard/Guatemalan palm) is almost the same size and shape as my Akubra Fed IVs made with rabbit/hare felt. Weighing them using the proper equipment might reveal a minor difference in weights, but it's not noticeable to me when I'm either holding them in my hands or wearing them. 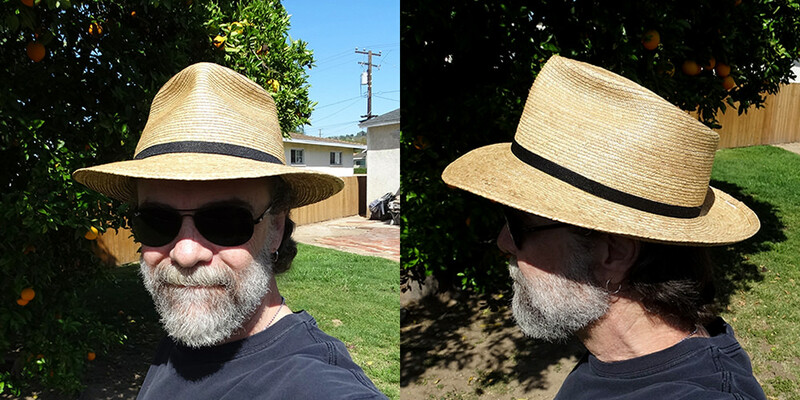 Most, if not all, palm or straw hats will be cooler than a fur felt hat simply because the palm/straw "breathes" better; i.e., the way they're constructed allows air to flow between tiny gaps in the weave. In warmer/hotter/more humid weather I can definitively state I sweat considerably less when wearing my Sunbody than I do when wearing any of my Akubras. Another "pro" in favor of Sunbody's hats is that you can get them wet. Get most traditional straw or cheap palm hats wet, and they're pretty much ruined. But Sunbody actually advises their customers to occasionally "douse" their hats to keep them from getting dried out and brittle. The day I received mine I soaked it in a sink filled with lukewarm water for three to five minutes so I could give it the shape I wanted (see here if you're interested) and it suffered no ill effects. I am thinking about getting the Fedora 2 1/2 inch or 3 inch brim in the lighter bleached color as I think I would like the lighter color better . Can you tell me how high the crown is ? I am even thinking about ordering one of the open crown ventilated hats and getting the brim cut down. I wonder if Sunbody gives any discount for Fedora Lounge Members ? ...I am thinking about getting the Fedora 2 1/2 inch or 3 inch brim in the lighter bleached color as I think I would like the lighter color better . The hat you're considering is similar to mine, but still a different model so I can't say how tall the crown would be. On mine the crown as it's currently creased is 4-1/8" in the front and tapers down to 3-1/2" in the back. I only slightly modified the crease on mine and didn't take it to open crown, but after taking some measurements I'd say the open crown height would probably be 5-1/4" to 5-1/2". I didn't order mine from Sunbody, but I've read they are willing to accommodate reasonable modification requests (trimming a wide brim to a narrower width, for example) if you contact them before you buy one of their hats. Speaking of brim widths, just because they say one of their hats has a specific brim width it doesn't necessarily mean it will. The brim on my hat was advertised as having a 2-1/2" brim, but it seemed wider so I measured it and I got 2-9/16" on the left side, 2-5/8" on the right side, and 2-3/4" front and rear. Not a huge difference, but not 2-1/2" all the way around either. I've never heard of them doing this, but it can't hurt to ask; the worst that can happen is they'll say, "No." Rmccamey, Tukwila, Bill Hughes and 1 other person like this. If I am understanding correctly, it takes about 1 1/4 inch off of an open crown to take it to a little over a 4 inch C crown ? The best way I can answer your question is, that seems to be the case with my hats. The one thing I know is a hat with a taller open crown gives you more material to work with so you can crease it as high or low as you want (within reason, of course). For example, you can easily crease a hat with a 5-1/2" open crown down to a 4" C-Crown, but that same crease will be very shallow if the open crown is only 4-1/2". One of the reasons I like my Akubra Fed IVs and Campdrafts is that they have taller straight-sided crowns with little to no taper so I can crease them to get the look I want and still have them fit on my head comfortably. When I creased them I didn't start out thinking "I'll crease this one to X inches", I just creased them to a crown height that I thought looked right taking the brim width(s) into consideration. As a result the crowns on my Feds are around 4-1/4" tall, and the Campdrafts closer to 4-1/2" because of their slightly wider brims. So, for me, a hat with an open crown height around 5-1/2" seems to be the "sweet spot"; any lower and it might not fit on my head. Dm101, DRB and scottyrocks like this. 4 1/4 and 5 inches and just trying to get an approximation of how high an open crown I need too start with . Based on your information I will consider a 5 1/2 open crown as the minimum starting point. Redfokker, belfastboy and Zombie_61 like this. For those that have one or have had one have you had any issues ? Stitches coming loose ,cracking etc . SB's have always besn tight on me but I'm sure they are just right for others. I think part of it is I never could find a long oval. I prefer the Stetson or Resistol straws. Bill Hughes and Redfokker like this. I got mine last summer and it got a few months worth of sweat, dirt and rain. It has held up very nicely thus far. The only things I've noticed are that occasionally little "hairs" will fray, and they are easy to trim off with no ill effects. There are some sweat stains that have made an appearance as well, but they can be controlled by soaking the hat. I work outside. The summer months here can be humid, and I sweat a lot, so seeing signs of sweat stains doesn't bother me too much. The manufacturer recommends periodically soaking the hat in water to help prevent the palm from drying out and becoming brittle. Doing this will also help prevent further fraying that regular palm hats are prone to. Soaking the hat also gives you the opportunity to reshape the hat as you please, and it is also refreshing to put a cool and wet hat on your head when it is hot out. Zombie_61, drmaxtejeda, Rmccamey and 2 others like this. Zombie_61 and Just A Hat Rack like this. Does anyone know if anyone makes an elastic bound edge for hats that can be used to easily change the the color of the bound edge ? Sure would be nice to be able change the color of the bound edge and the hat band as well on a whim. In addition to straw, what other materials do people choose for spring and summer fedoras that aren't too hot?